Fitting an electric shower is a great way to add a showering facility for those on a budget or with limited access to hot water. This article gives some guidance on things to consider before getting an electrician to install a new electric shower or replace an existing one. An electric shower is normally a small rectangular appliance fitted to the wall of the bath or shower cubicle wall. It comes with a hose, showerhead and a riser rail. It heats cold water from the mains as you need it using electric heating elements. 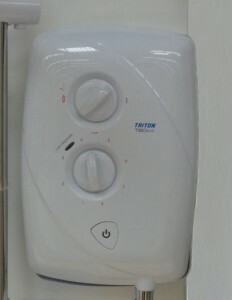 With an electric shower there is no need to wait for hot water to be heated by a separate system such as a gas boiler. How much warm water will I get? You won’t get lashings of water from an electric shower. For a showering temperature of 40° Centigrade an electric shower typically delivers 4 to 6 litres per minute in summer and 3 to 4.5 litres per minute in winter. This compares with 6 to 10 litres per minute for a mixer shower and 10 to 14 litres per minute for a power shower. The power of the shower is the one factor you can control when you install a new shower (but watch out for the cable size and the water pressure requirements). The flow from a 7kW shower in winter will be a disappointment for most people; a 10.5kW shower even in the depths of winter will be acceptable for most. An electric shower requires mains pressure cold water and a decent flow of water (to be technical over 1 bar pressure and at least 8 litres per minute) so make sure that you have suitable supply before deciding to install an electric shower. A higher kilowatt shower such as a 10.5kW may require 1.5 bar water pressure at 11 litres a minute. The maximum static water pressure should be no more than 10 bar. This is a very high pressure but sometimes if you live near to a water pumping station that has to pump water up a hill you may sometimes experience this pressure; if you do have higher pressures then a pressure reducing valve can be installed by the mains stopcock. Some older houses with cold water tanks in the loft only have a gravity fed cold supply upstairs (also known as a low pressure supply – usually 0.1-0.3 bar pressure). In these houses the kitchen sink should have mains cold water; you will have to figure out the best place to tap into this supply so you can run a separate mains cold water feed for the shower – it is likely to be somewhere between the mains stopcock and the kitchen sink. An electric shower will not work on a low pressure supply, although you can buy a specialist product like a Triton T90xr pumped electric shower which is specifically designed for this situation (it’s incredibly popular in Ireland where this type of arrangement is common). To ensure the shower can be serviced it is essential that the water supply to the shower can be isolated. A 15mm isolation valve needs to be fitted where it is easily accessible (don’t hide it under floorboards or behind tiled walls). An electric shower can draw upto 45 Amps of electric current and it requires a separate supply cable and fuse from the consumer unit. 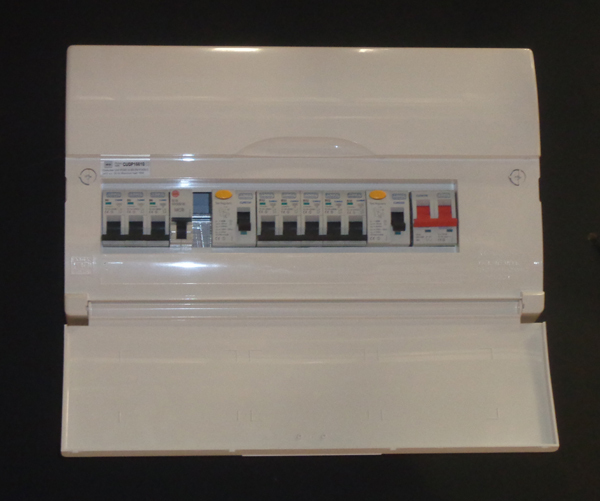 A 30mA residual current device (RCD) must be installed in the electric shower circuit; this may be part of the consumer unit or a separate unit. Many older properties may only have a 60 Amp supply to the entire house (more modern ones have 80 Amp or 100 Amp) and some large electric cooker also require a 45 Amp supply so it’s worth checking whether you need to upgrade the supply to the house; a qualified electrician should be able to tell you this – normally you will not be using the shower and having every part of the oven and hobs running at full blast all at the same time. The electric cable size is calculated based on the power of the shower, the length of cable run and where the cable is running (running through insulation will reduce the current carrying capacity). When installing an electric shower for the first time it’s best to future proof the installation and put in cable that’s suitable for a 10.5kW shower, even if you are only installing an 8.5kW shower. That way you won’t have a problem if you want to upgrade the power in the future. This means you will be using 10mm² cable in most cases (16mm² in very extreme cases of long cable runs through insulation). Don’t listen to the installer when they say it’s going to cost a lot more than using 6mm² cable. Using 10mm² cable will maybe cost another £1.50 extra per metre of cable compared with using 6mm² cable. So if you use 20 metres of cable that’s an extra £30; and 20 metres is quite a long cable run to start with. Better to do this initially than have to replace the cable when you want to upgrade; especially if the cable has been hidden in trunking or behind a wall. So why doesn’t everyone install a 10.5kW shower every time? Well it’s certainly our preferred option but if you are replacing an existing electric shower and the original supply cable is 6mm² then putting a 10.5kW shower in would overload the cable causing potentially dangerous overheating. Depending on the circumstances you may well be limited to replacing with an 8.5kW shower unless you are prepared to replace the electric cable running from the consumer unit. A qualified electrician will be able to recommend the maximum power of shower that a circuit can take. As well as a separate cable which is normally run in the bathroom ceiling, you also need an isolation switch near the shower. 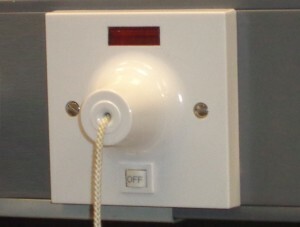 These are often 45 amp double pole isolating pull cord switches with a minimum contact gap of 3 mm in both poles; they generally have a red light to show when power is going to the shower. 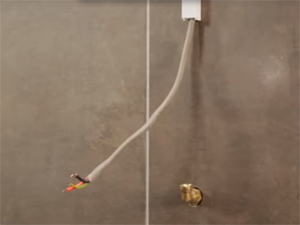 Best ways to install cable and pipe in the bathroom or shower cubicle. Ideally the pipe and cable should be routed in the wall behind the shower to hide them from view. This is not always easy to achieve but it is well worth doing if you want an attractive bathroom. You can sometimes use a false wall as shown in the photo. 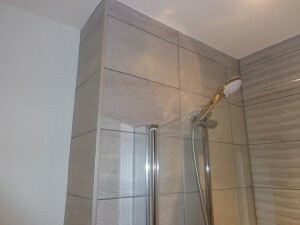 The wall can then be fully tiled to create a neat attractive finish. Where you have a solid wall then consider cutting a channel to bury the pipes in trunking in the wall; this can be done either with a chisel or with an angle grinder. Once the cable and pipe have been installed the wall needs to be repaired ready for tiling. Installing the cable and pipe under the surface in a channel can be a problem where you are adding a new electric shower to an already tiled bathroom. The electric cable is likely to be run down from the ceiling (as it needs to be connected to the ceiling mounted isolation switch) whilst the cold water feed is probably going to be run up from the bathroom floor where the rest of the plumbing is likely to be. It may require removing and then re-tiling a section of the wall which can be a challenge unless you have some spare matching tiles. The alternative is to run trunking on the surface. The photo shows a hybrid option where the electric cable is run in surface mounted trunking from the ceiling and the cold water comes from behind. Different electric showers may have different entry point for the cold water pipe and the electric cable. For a new installation you can choose the shower you prefer and then run the pipes and cables to suit. For a replacement shower it is best to check that the shower you are buying can be fitted on the existing services without changes having to be made. It can be very frustrating if the cold water is plumbed to come in from the right of the shower and the new shower only has left water entry. Manufacturers are well aware of the challenges of replacing one shower with another and some can give advice on compatibility. 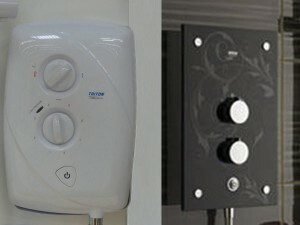 There are now some shower models that have designs to cope with different layouts; for instance by having swivelling connections on the water inlet to cope with supply from left or right. be undertaken by a competent person who is registered with one of the Government-approved scheme providers. 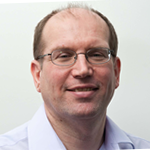 They can issue a certificate of compliance for the work on completion. or you can use a non-registered installer who has appointed a registered third party certifier to carry out inspection and testing during and on completion. Which ever route you choose you should end up with a certificate of compliance for the work. Keep this as it may be required if you are selling your home or making an insurance claim related to the work. Replacing an electric shower on an existing circuit is not covered by Part P of The Building Regulations. However do be aware that if the replacement electric shower is more powerful than the one originally installed then you may need to upgrade the wiring and/or fuses.